Exactly 7 years ago – on December 28, 2004 – we received the news that Susan Sontag had died in New York City after a battle of nearly three decades with cancer. Her death did not go unnoticed and it could not have: The dark lady of American letters had been for decades an icon and something of an institution in everything that had to do with literature, art, photography, film, political activism and also homosexuality. She wrote in the course of the 1960’s and 1970’s essays that vastly influenced the way we look today at popular art forms like films and photography, at the avant-garde movement in general and introduced into contemporary culture a certain seriousness to discuss these things, the momentum of which, has still not withered. Then there was her celebrated role in the anti-Vietnam movement, her call for military intervention during the Bosnian war, which intensified and captured international attention after she moved to besieged Sarajevo in 1994 to direct a performance of Beckett’s “Waiting for Godot” in the ruins of a local theater; and then in the early 2000’s, a fierce criticism of the Bush administration, vocal opposition to the occupation of Iraq and a defying look at the events of 9-11. Lastly there was also her dramatic and distinctive physical presence: A combination of grace and melancholy, easily recognizable by a long mane of dark hair with a shock of white at the temple; the walking voice of America’s finest intellect and a frequent sight in the cinemas and theaters of New York. But to be sure, there has been hardly anything passive and contemplative about this past year, and while anger, fear and dread have been at an all-time high, it is not with admiration but with preoccupation that Susan Sontag is worthy of remembrance today. In later years, after surviving cancer for the first time, Sontag had second thoughts about the language that people use to talk about sickness and cancer in particular, that she put together in a now canonical study titled “Illness as Metaphor”. Her argument was that this language – often inflected with military terminology such as battle, attack, invasion – made people feel responsible for their condition, and that in the end cancer had become a metaphor for all evil. Most prominently in Western media the now popular idea that Islam is the cancer of Western civilization, in Israel the opinion heard since the times of Ariel Sharon that the Palestinians are the cancer of Israel and the so-called “free world” and lastly the assumption in the Arab world that both the West and Israel are a cancer at the heart of the Ummah. To think that a country, a group, a race or a people are an illness or the embodiment of “evil” serves to suggest the presumption of absolute innocence on the part of the group that passes such terminal judgment, no less than that there is no possible solution other than complete extermination, which is what is often necessary to treat a limb or an organ affected by cancer. Her observation was that humans are capable of unimaginable cruelty as much as they are capable of unimaginable goodness, but that it is only a minority of us that are inclined toward either, while the majority could do one or the other, depending on where the wind blows on that day and what our motivations, drives and influences are. Being both cruel and good is not exceptional. Generalizations such as “Terror”, “Islam”, “the West”, are not cancers or forms of radical good or evil, but rather imaginary institutions that help us ensure a degree of sanity and make us comfortable in a turbulent world, by safeguarding our innocence. The reactions came without delay: She was nicknamed Osama bin Sontag, people demanded that she were strip of citizenship and deported, and the New Republic published an article that opened with the question, “What do Saddam Hussein, Osama Bin Laden and Susan Sontag have in common?” The answer of course was that Ms. Sontag wanted nothing but the destruction of America. These reactions are giving us a lot of information about the mood of moral outrage in which we have been living permanently since 9-11 and that has been exponentially augmented in the course of the continued invasion of Iraq, Afghanistan and the events surrounding Arab Spring. In the aftermath of the scandal, Ms. Sontag said in different interviews not only that “this country is going to change, and not for the better” but also expressed concern about how more terror attacks – in her view illegitimate in every way and place – would transform the United States into something close to a police state. Since then, war on terror has become the morally purified excuse for invasion, looting and destruction of entire countries, and perpetuated the old self-inflated McCarthyism in which it is acceptable to use totalitarian means to fight totalitarian enemies, even by democratic countries. This imperial project has tirelessly looked for new enemies of mankind, freedom and liberty that can impose and reflect a binary opposition between the West and the rest of the world, out of which no one has benefited more than tyranny. This paranoia, actively promoted by the Bush administration has not fallen on deaf ears and has certainly obscured the fact of what Sontag said in one of her last public interviews, that there is only one political party in America – the Republican, and has a branch, the Democratic. Scandalous as the statement is, it has been confirmed time and again by the Obama administration in its treatment of Arab Spring, in which emphasis was put on some dictators and loosened on others, at the same time that “free world” rhetoric made a spectacular come back in the NATO plan to liberate Libya while it has been remarkably slow on Syria, has almost universally failed to address the countless human rights violations in Egypt by the Supreme Council of the Armed Forces and kept silent on Yemen and other countries. It seems as if in the mind of policy-makers, free world is a very selective concept and does not necessarily translate into decent world; what is easily observable in the copious quantities of weapons and tear gas that are shipped to countries at war with their own citizens, as quickly as expressions of moral outrage and deep concern on the part of the same policy-makers are televised on a daily basis, only to be quickly replaced by news of more assaults, massacres and violations. The illusion of a free world that is plagued by imaginary enemies that threaten the perfect order and with which we are at “war”, is as banal as the anti-Western rhetoric in the Middle East that universally blames the West for each and every failure. These illusions are not only equivalent but also the two sides of the very same policy coin. It seems that with and in spite of Sontag, we keep living in a world that is plagued by cancers, after whose elimination, peace and order will be restored and the revolutions or democratic institutions will deliver all their fantastic promises. The enemy is always somewhere out there and can be easily identified, often by name and place of residence. “Terror”, “Islam”, “West” as described in these sanitation manuals that go by the name of policy, are not concrete enemies but methods and means of action whose purpose cannot be viewed as uniform and that are not only one person. In the period that followed 9-11 and in which we witnessed the re-making of the United States by the Republican Party, Susan Sontag stood in the public eye as the now commonplace figure of the traitor: Someone who blasted the appeasement of media to war and scaremongering leaders, with people universally conforming to whatever they are being told, and the bigger the lie, the greater the sense of self-satisfaction and moral outrage. Patriotism is not loyalty because loyalty is something that can happen only between individual people, and it is because of patriotism that Ms. Sontag became the scapegoat of the Right, in the same way that people like Samira Ibrahim, Alaa Abd El Fattah and Maikel Nabil are singled out by authorities and public alike as traitors and people who want nothing but the destruction of their country. A patriot is not the one who best conforms to the popular lies of the day, but whoever refuses to let an entire country go down the path of deceit and self-destruction at the hand of an irresponsible leadership that encourages moral outrage but is of course not in possession of any morality to begin with, simply because morality is not a prerequisite for policy-making. 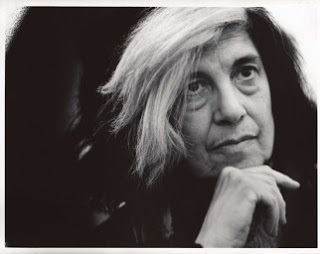 What singles out Ms. Sontag from the activists of Arab Spring is that she was not primarily an activist and that her work, varied as it was, was mainly in the domain of art and literature. This doesn’t tell us so much about politics as it does about art and literature, and the reason why they should be encouraged beyond ideological, cultural and political divides.